The 4th International Conference on the Economics of Happiness 2018 Jeonju hold on November 8~9, 2018 at the Korea Traditional Culture Center in Jeonju to explore solutions for happiness and better future of citizens. JEONJU--(Korea Newswire) October 23, 2018 -- The 4th International Conference on the Economics of Happiness 2018 Jeonju will be held on November 8~9, 2018 at the Korea Traditional Culture Center in Jeonju to explore solutions for happiness and better future of citizens. Jeonju is the most unique Korean city and a typical tourist destination in Asia that has successfully preserved Korean traditional culture. With participation by experts in human, ecosystemic and social economics as well as leaders in organizations and entrepreneurs, including Helena Norberg Hodge, President of Local Futures, the International Conference on the Economics of Happiness 2018 will feature lectures and discussions to share experiences and present a vision under the subtitle of the ‘Strategy for Localization’. Starting with a keynote address by President Hodge, Junko Edahiro, President of the Institute for Studies in Happiness, Economy and Society in Japan, Takahashi Hiromichi, CEO of PAL System, and Jay Tompt, Professor of Economics at University of Plymouth in the UK will present lectures. The Conference will also feature three workshop sessions on the future of regions, local foods, and region-based social finance. Also, the Second Jeonju World Slowness Forum and Slowness Award will be held on October 24~25, 2018 which will be attended by world’s prominent experts to discuss policies of slow cities and slowness movement. Dr. Franz Alt, a German journalist who is well known for solar energy revolution and green economy, and Ulrik Goos Iversen, a school principal in Denmark, will deliver lectures to seek and share ways of being happy through slowness, smallness and simplicity. 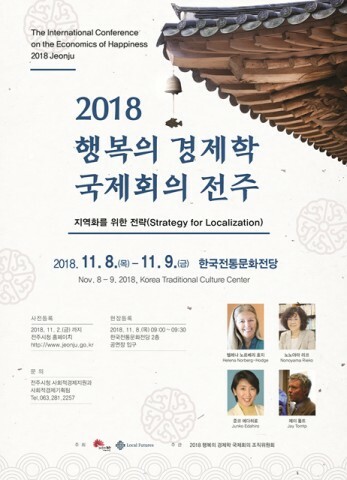 An international scientific forum will also be held on October 25~27, 2018 in Jeonju to build a global network of intangible cultural heritages with all countries and to discuss means of sustainable preservation and cooperation for intangible cultural heritages. Jeonju is the storehouse of intangible cultural heritages with 45 intangible cultural assets, the largest number in Korea. “In this fall, Jeonju is hosting three representative international forums and a large-scale festival such as the Jeonju Bibimbap Festival. We expect visitors will have a valuable chance of finding solutions for happier future in this unique city with Korean traits,” Jeonju Mayor Kim Seung-su said.